Nik Huber, founder and managing director of Nik Huber Guitars, carries on a more than 100 year old family tradition. In 1896 a heritage of woodworking expertise was born to proud parent Nikolaus Huber in a small village in Southern Bavaria. Today Nikolaus Huber IV carries that expertise forward in the form of exquisite guitars. 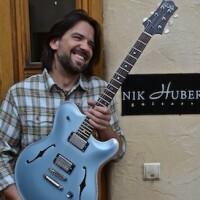 Nik Huber Guitars was founded in 1996. Since then, the company grew slowly but constantly. Today a team of 5 highly skilled specialists is building approximately 220 hand-crafted instruments a year, with help from a little CNC machine. Coming from a family that always worked with wood, it was no suprise to my family and myself that I always had the interest in and passion for working with it as well. I just had to combine this passion with my interest in making music and especially in playing the guitar. To this day, building a guitar still fascinates me in the way I felt while working on my first self-built guitar.